I woke up at 5 AM and left the house in Port Orchard at 6am. I drove straight to the Ho rain forest with only two pit stops and arrived at the Ho visitor center at 9:45 am. A bobcat ran across the road in front of my van just outside of Forks. I took the bobcat as a sign of good things to come. Upon arrival at the Ho Visitor Center I told the Ranger where I planned to stay for the next six nights and I obtained my permit. I was instructed to hang my permit on my backpack while I was hiking and on my tent while camped. I went back out to my van to get my pack out and get started on my hike. But somehow I had lost the permit between my van and the visitor center. Embarrassed I had to go back in and ask for another Permit. Finally at 10:40 I started my hike I intended to camp at 7.8-mile camp the first night. The hike starts in a moss-covered rain forest. I passed at least 7 people in the first mile; most of them were day hikers. A large group of hikers loaded up with climbing gear passed me about a mile and a half into the hike. Two miles into my hike I learned the hard way to drag my pack off the trail with me when I take a break. 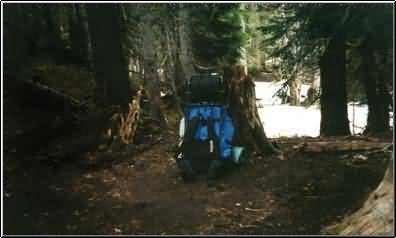 I left my pack on the trail side while I headed for the nearest large tree to answer the call of nature. Two day hikers a man and a woman saw my pack and started looking for me. I could hear them asking each other if someone had lost there pack. Just as I stood up I saw the man looking at me! I stopped at the two-mile campground and had a snack under some huge old cedar trees. I was trying to take my time and enjoy my hike. It�s too easy for me to get caught up into trying to make good time instead of having a good time. About 3.5 miles into the hike I started looking for �Happy Four� campground. But it was actually 5.3 miles down the trail and not 4 miles like I had expected. The trail was quite muddy in spots and the ranger at the visitor center told me that I was expected to hike right through the middle of the mud holes in the trail. I tried to oblige but drew the line and stepping into mud holes and mud puddles that would go over the top of my boots. The trail gets a little bit rougher at about the 4-mile mark and roots and rocks start to appear on the trail. It is still a well-maintained trail at this point though. 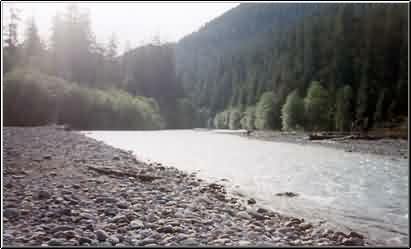 in to Olympic Guard Station (900 feet) and set up camp on the bank of the Ho River. The guard station is an actual cabin built in the 1930�s and was manned by three or four rangers when I got there. I woke up at 6:45 am. To my pleasant surprise a Doe and two fawns were standing on the gravel bar ten feet from my campsite. I watched them for a while and took a few pictures before they crossed the creek and ran past my tent. There was another Doe in the campground that had one fawn. I watched her nurse and preen her baby. There were many huge trees in the Olympic Guard Station campground, the campground it�s self was set in a meadow of tall grass. I reached the �Hi Ho� bridge 12.5 miles down the trail, at about 2:00. The bridge was higher than I had expected. The Ho below was crammed into a little ravine and was moving fast. Glacier creek joined the Ho at this point and was just as looked large as the Ho with the Ho being crammed into the little ravine. I paused and took a few pictures at the bridge along with another hiker who appeared to be a photographer. The other hiker a man in about his 40�s informed me that he was low on food but had enough to get by after I told him that my pack was heavy with six days worth of food. I thought about giving him something but I had just realized that my breakfast cereal was not giving me the calories I needed (I was um.. having trouble digesting it) and decided I did not have any food to spare. The trail turned south and started climbing after the bridge. Before the bridge the trail was mostly level. As the trail left the river valley and headed up towards mount Olympus the forest changed from old growth Hemlock to old growth Douglas fir. The trail switch backed many times and passed a pretty creek several times. I found a nice cluster of little quartz crystals a mile past the bridge. I buried it and marked the spot so I could find it on the way back down. I was got very tired miles before I reached Elk Lake and I almost stopped at �Martin Creek� campground instead of hiking on. I almost passed the photographer from the HI Ho Bridge several times on the way up to Elk Lake as he stopped to take pictures. He made me feel a little nervous when he made a comment about his glasses fogging up because he was so hot. That part seemed perfectly normal to me but when he added that he did not mean he was getting hot in a personal way I thought he was quite odd. Why add that? It had never entered my mind that he meant anything other than he was hot from hiking. I decided it would be best to stay clear of this hot and hungry man. 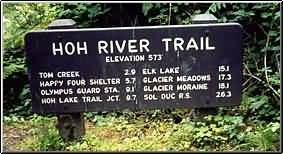 < When I reached Elk lake Campground (2,700 feet) the man from the Hi Ho Bridge who seemed to want food arrived shortly after I did and stopped at the shelter at Elk Lake to eat lunch. He told me that his stove was broken and asked if I had a stove cleaning kit. I did not know if his stove was really broken or if he was really hungry at this point or if he was just trying to find ways to talk to me. I decided to keep going when I saw that all the campsites at Elk Lake were full except one or two that were in the mud. The trail climbed higher and higher and was soon hugging the side of a mostly treeless mountain. The trail was real narrow at this point with a steep long drop off on one side and the mountain on the other side. In places water crossed over the narrow trail. It was a little bit scary to traverse over this with my fully loaded backpack on. I reached Glacier Meadows (4,300 feet) at 6:30 tired and relieved to have made it but a little disoriented. It was hard to find a snow free campsite but I did find one and it was in view of the ranger�s yurt. I felt safer staying in campgrounds that had rangers stationed at them. Things that go bump in the night are much less scary when there are rangers near by. The campsite was almost full. I was a little surprised to find that a campground 17 miles away from the trail head was so busy. The other campers all seemed to have very good and very expensive gear. They were wearing �Mountain Hardware� parkas and had Mountain Hardware tents. I began to wonder if I had gotten myself into a situation that I could not cope with in my Coleman tent and dressed head to toe (with the exception of my Asolo boots) in clothes bought at Wall-mart, Good Will and Value Village. The other campers mostly had sets of $50.00 (each) trekking poles made just for backpacking, I had a ski pole that I bought in a set for $5.00 at St. Vincent De Paul. But I reminded myself that I had done my research well and if I got really cold had several layers of clothes to wear including full rain gear. My tent (Coleman Peak 1) was a $67.00 tent but it had proven it�s self to be sturdy water tight in past trips.. I had plenty of food and stove fuel as well. I also felt comforted when I remembered the expedition weight capaline bottoms I had stowed in my pack. A Good Will find that only cost me $1.99. My gear was cheaply bought but it was well thought out. Also I did have a down Parka, a hand me down from my great uncle who passed away. I would not have dreamed of hauling that heavy thing up the hill with me. No way that it would have even fit in my pack that was already crammed full thanks to my bear canister. The photographer who was low on food and had a broken stove arrived at Glacier Meadows shortly after I did. I was really hoping that he was staying at Elk Lake and I wondered if he had followed my up there. I stopped and chatted with him, his stove was still broken and he was headed for the Ranger�s Yurt to ask for assistance with his stove and permission to have a campfire if he could not get his stove working. My legs and feet were very cold when I woke up at 6:30am so I put on an extra pair of wool socks and pulled my nylon shell pants on over my long underwear and went back to sleep. Feeling a little warmer at 7:30 I got up and made a hot cup of coffee and cooked my breakfast. 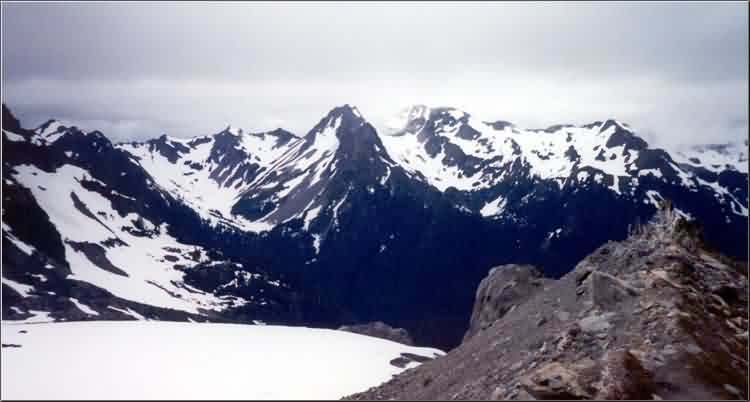 I lingered over my coffee until about 9:30 and then grabbed my �ten essentials� for day hiking and headed for blue glacier leaving my tent and backpack behind. I did how ever have all of my clothes on and was just barely warm enough. As I headed up the steep trail to Blue Glacier I was greeted by a meadows full of flowers. 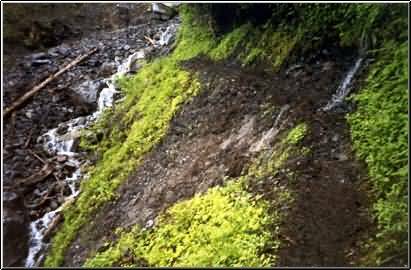 I found the spot where glacier creek came out of the snow and drained into a little pool. It was all very pretty. I passed two other day hikers who had just come down from the glacier and they reported that it was too foggy to see anything. But I continued up the hill shedding my extra clothes on the way. Soon I was toe kicking my way up a steep snow covered hill in just a short -sleeved shirt and thin nylon pants. I found a talking creek on the way down and paused to listen to it. I don't know what language it was speaking in but it seemed to have a lot of stories to tell. I enjoyed imagining that it was telling stories in the language of the Ho Indians who had once inhabited this beautiful valley. I hiked on and paused again for lunch at the �Hi Ho Bridge�. I decided to cook up the dinner I had not eaten my first night at Glacier Meadows instead of eating my usual trail mix for lunch. While I was cooking lunch the skies blackened and the sun disappeared, it was threatening to rain. I packed up every thing that I did not need to cook lunch and donned my full rain gear. I finished cooking right before the rain started. I ate my lunch while standing in the rain on the �Hi Ho Bridge�. After lunch I pushed on to Olympic Guard Station, it rained off on. At one point it really started to pour so I took shelter under a fallen tree that was over hanging the trail until the sun came back out. I was very tired when I arrived at Olympic Guard Station at 3:30 and I could only find one camp site left on this busy 4th of July in the Ho Rain Forest. I did not much care for this campsite located so close to the trail but I was soon quite happy to have found it. After I pitched my tent groups backpackers started pouring in looking for spots. Many of them were turned away and had to camp elsewhere or pitch their tents on the gravel bar. The rain was still coming down in scattered showers as they were looking for places to camp. I climbed into my tent and started reading the Harry Potter book I had brought with me. I slept quite well on the 4th of July and I did not hear a single fire cracker all day as I was nine miles deep into the National Park where fire works were against the regulations. I woke up and saw that the sun wanted to shine but there was no way that it was going to hit my tent under the trees in the meadow. Longing for sunshine to dry out my tent and rain clothes I broke camp at 7:30 am without breakfast or my morning coffee and headed for �Happy Four� campground just three miles away. I stopped a few miles down the trail and laid out my tarp in a muddy meadow and sat and cooked breakfast, made coffee and re braided my hair. I felt very refreshed and ready to go after that. I packed up my tarp and headed down the trail only to find that I was just a quarter of a mile a way from Happy Four campground. Once again I had been confused by the fact that Happy Four Campground was 5.3 miles up the trail instead of 4 miles. I watched as group of young men attempted to ford the Ho River with their backpacks on. One man made it across but the others refused to try. The backpacker who made it across re crossed the river and he and his friends set up camp on the large gravel bed the same side of the river as my camp but about 200 feet closer to the woods. I lounged around the campground reading my book and exploring the river bank for the rest of the day. I really enjoyed the full sunshine out on the exposed gravel bed after days of hiking in the shade of the rain forest. I slept very fitfully that night. Just as I would fall asleep I would hear �bears� wandering around my tent. This happened several times. The closer I got to the trail head the more walkers I saw. First I saw backpackers who were going on very short hikes, then I saw day hikers and then finally I started to see car tourists out on strolls with their cameras. I quit saying hi to everyone I passed at about the one mile mark. People�s attitudes had changed. The people I was a passing by then were no longer my fellow backpackers and they had stopped responding as nicely when I said hi to them. By noon I had hiked out to the trail head. What a shock it was for me to walk out into the parking lot at the Hon Visitor Center and see a lot full of cars and people walking everywhere. I had not seen or heard car in five days. I felt like I was in a daze, it was so uncomfortable for me to have to dodge cars in the parking lot with my backpack on so I could get to my car. I wanted to flee back into the woods. I still had one night�s food with me. I gave it serious thought but I knew I did not have the energy to hike far enough back up the trail to get away from the throngs of people. The Ho River Trial is a beautiful hike and I had a wonderful exciting adventure there. I hope to go back someday maybe with my daughter when she is old enough.